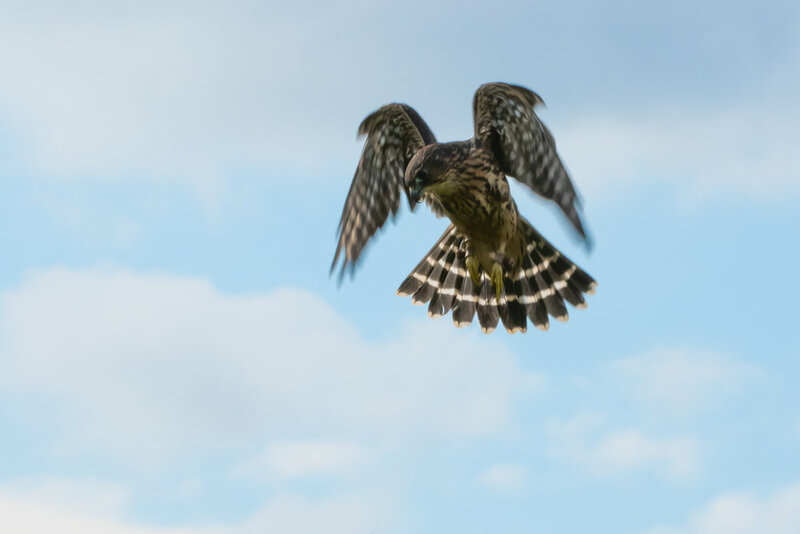 Birds of Prey at the Wye Marsh - Only 2 dates in 2019! From shots of squirrels in your backyard to capturing stunning photos of Bald Eagles in flight, what you will learn on this session is exactly what you need to know to make sharp purposeful photographs of birds in flight. Join the Daytripper Photo instructors in Midland at the Wye Marsh as we teach you how to control your camera’s settings and give you a full 1 hour photo essentials class before heading out into the natural landscape of the marsh to photograph multiple birds of prey for a full 3 hours of hands on learning experience. This is by far the best way to learn how to make better photos of wildlife and will leave you with photos, memories, and real world experience that you will cherish forever. The spinoff has been something that has gained momentum over the past years and this year it promises to be even hotter! This event is open to 2 categories. 1: Spinners - Bring your own steel wool spinning device and take centre stage. The top 3 spinners will win a special trophy and the top spinner will walk away with a 100.00 cash prize! There's no cost to be a spinner but you must supply your own steel wool and your device must be tested and work safely. 2: Photographer - Like our Bring on the night - Fire on ice sessions, there will be the Daytripper Photo instructors on hand for this event so your questions will be answered and there will be help to make the best photos you can. UNLIKE the BOTN FOI sessions, there will be no photo essentials class before hand and you are expected to know what you would need to know to get yourself going. Because this is a fun show more than a DTP class, there is only a $40.00 charge for this session! Register early to ensure your spot at this fascinating and photographically amazing event! Register for this session here. It's only $40.00 to shoot and FREE to spin! The overnight Island session has evolved for 2019. For the first time, Daytripper Photo will be visiting the Killarney Mountain Lodge for our overnight session. The Island in North Bay was excellent and we had 3 great years there… maybe even more down the road… But…. Killarney Mountain Lodge…. This place is something else! Of course the real reason we have this session is so we can spend plenty of time working on some very specialized styles of photography. From sunrise and sunset to shooting the moon and other stars and night photography to wildlife and landscape photography in the pristine northern Ontario countryside! With no cities nearby and separated from most civilization by a huge Canadian National Park (The Killarney national park) we will have no distractions from the outside world and will be able to immerse ourselves in the creative world of photography! Our instructors will be the amazing Martin Ingles, Philip Zoratto, and owner of DTP, Bryan Weiss. With these three its not just a learning experience you’ll go home with but memories of laughter, fun, inspiration, and motivation that will stay with you long after you’re home and back to your daily grind. On sessions like this, there are not only hands on workshops while at pre planned and scouted locations, there are also photo reviews and editing sessions that will open your eyes to a whole new world of photography. And then, of course, there’s the main attraction… The Killarney Mountain Lodge. This high end resort boasts the most beautiful views and accomodations in Ontario and with their stellar staff and other amenities, any off time you have from shooting will bathe you in luxury. The room choices for our trip are as follows. There will also be a special bonfire on Saturday night with s’mores! Philip Zoratto is a skilled instructor with years of experience teaching how to get the most out of the editing softwares Adobe Lightroom and Photoshop. In this session you will learn advanced editing techniques using Lightroom. Once you learn how to use the library module you will want to start advanced editing using the develop module within Lightroom. From the essentials of adjusting exposure to some really cool techniques for cloning and selective editing and even black and white conversion! Since this is a Daytripper Photo masterclass, you will also have DTP owner Bryan Weiss on hand to assist and help out while Philip teaches. Since this session is only open to 8 people, you will get excellent support throughout the 3 hour session. You bring the laptop with the software loaded and we’ll show you how to use it! Nikon DSLR cameras have the same menu and the same core functions. Owner of Daytripper Photo has been running sessions on Nikon DSLR cameras for more than a decade. From head to toe, he will go over each function in the menu and explain what it does and how you can use it in your day to day photography. This 2 hour session is fantastic for someone who’s owned their camera for a while but never really understood all it has to offer or for someone who’s just gotten their new Nikon and wants a head start on what it can do. Masterclass with Michael Lane - Composite photography. Michael Lane is a brilliant photographer and is known for his composite work. Blending in multiple images to create a master vision is what sets Michael apart and in this session he will be sharing his techniques with you! There are only 8 spaces available for this session as you will be using your own computers, Michael's images, and will be working together to blend and compose your works of art. This session is only $200.00 and you will be supplied with all the notes on what was covered. Register for your spot by clicking here. Join us in Tottenham as the Ontario Falconry Centre joins us for this exclusive opportunity to learn tips and techniques for photographing birds of prey in flight and up close and personal. There will be many majestic birds of prey including bald eagles, falcons, hawks, owls, and more! This session will be held in Tottenham on a working horse farm in classic Ontario countryside. We will get longer flights, closer more natural looking photos, and no distractions in the photo's backgrounds. This session is only $200.00 for a one hour photo essentials class to prepare you, three hours of photographing the birds with the Daytripper Photo instructors by your side the whole time helping you make better photos, Sigma lenses to use for the day... including many of their best super telephoto, macro, and prime lenses, and a follow up hangout to review your results and discuss any questions you may have after the session at The Loft Studio in Newmarket. Take your creativity to a whole new level! Joseph Leduc has been inspiring and educating photographers for a long time and finally he is teaming up with Daytripper Photo to bring his passion for creativity and understanding of photography to our clients. This session promises to give you a whole new toolbox full of photo tricks and techniques and will get you making photos you only dreamed of. He will be teaching how to make the images that you see in this email. If you are looking for something new and exciting to learn in the world of photography, don't miss out on this Daytripper Photo exclusive Master Class! Working with water droplets or different oils and colours will give you a whole new world of interesting photography subjects. We will be showing you how to make these photos with hands on instruction and guidance. Playing with water opens you up to so many different things to photograph. From dropping fruit or vegetables into fishtanks to working with a small bowl of water. Join us as we travel to Bowmanville and visit the Ontario Falconry Centre for this exclusive opportunity to learn tips and techniques for photographing birds of prey in flight and up close and personal. There will be more than a dozen majestic birds of prey including bald eagles, peregrine falcons, kestrel, hawks, and owls. Since we are traveling to their location, we will get longer flights, closer more natural looking photos, and no risk of people's pets being carried off during a session........not that that's ever happened of course. This session is only $200.00 for a one hour photo essentials class to prepare you, three hours of photographing the birds with the Daytripper Photo instructors by your side the whole time helping you make better photos, Sigma lenses to use for the day... including many of their best super telephoto, macro, and prime lenses, and a follow up online hangout to review your results and discuss any questions you may have after the session. This April 24th will mark our 9th spring Algonquin Park trip. While the contents of the session have changed from year to year, the vibe and experience is always the best it can be! We will be visiting waterfalls at the perfect time of day to capture stunning images and we will be by your side the entire time offering advice and tips on how to best use your camera to achieve your photographic goals. With a full photography essentials class on the way there and a follow up online hangout a week after the session and Sigma lenses to use throughout the day, this session is one of the best ways to learn photography. Navy is known for her use of light and keen eye for details. She currently teaches at Sheridan College and is experienced in portraiture and fashion photography. This session is a complete 4 hour session covering everything from lens choices to lighting with strobes and flash to balancing ambient and external lighting. With hands on shooting you will be using light modifiers and seeing the differences each makes for headshots, full body and dramatic shots. While some people are amazing photographers and others may be amazing educators, getting both in one package is rare indeed. Navy is that rare talent that can have you leaving a class inspired, motivated, and educated and then when you get home and look up her work you marvel at the beauty and spirit she can capture in each frame. You will also have Bryan Weiss - Owner of Daytripper Photo on hand to assist in any way. Taking this Master Class will assure you confidence with the camera and your model and leave you a better portrait photographer. See Navy at work while teaching last year's Wedding Photography session with Gabriel Bousquet. Bring on the night - Fire on ice! This will be an eye opening session that will teach how to control your camera in low light conditions. Whether it's photos you are trying to make while out walking the dog, or fireworks on Canada day, this session will be covering everything you will need to know to make stunning and inspiring photos at night. The Daytripper Photo BOTN sessions have helped hundreds of people make better night time photos and this year we are at it again. For only $100.00 you will gain the experience you need while the Daytripper instructors are by your side every step of the way. There will also be a FREE How 2 hangout online session review for all who participate in the BOTN session. We will meet online using Google Hangouts and be able to discuss the event and even share and critique our photos... all from the comfort of your own home! This session only has 15 spots available so please register at your earliest convenience if you plan to attend. Learn how to create a world of light and texture ... anywhere. With this type of photography, you don't need a big studio or special lighting. Flashlights and inexpensive fiber optics are all you need to make anything your mind can imagine. This session will teach you everything you need to open your eyes to this fun form of photography. This will be the third Daytripper Photo hockey session and will be the best yet! We will be teaching everything from how to use your gear, to how the settings work, to advanced focusing techniques and everything else you need to know. With two games and an hour and a half break between games to review photos and discuss new tips and techniques, you will learn what you need to know, practice it, review it, then practice it again! Is there a better way to learn? We don't think so! Join Daytripper Photo on January 9th 2016 from 3pm to 9pm and learn how to make better photos in the challenging environments in hockey arenas. There has been much fuss made about portrait lighting. But what light/look resonates best for you? Speedlight? Studio Flash? Ring Flash? Beauty Dish? Constant Lighting? There are so many options it can be overwhelming, not to mention expensive to try them all out. Well not anymore!! In this session we will be going bare bones basic. One light portraits, but multiple different stations with different types of light. Hands on training at each station. You get to shoot instead of just listening to us blather on. Register now for this rare photography opportunity! This session only has 10 spots available so please register at your earliest convenience if you plan to attend. Join Daytripper Photo in the Mobile Classroom for our Fall Foliage / Waterfalls session! On September 27th, we will be heading up to Bracebridge and Algonquin Park for waterfalls and fall foliage. We will be teaching how to use filters, tripods, and will have a wide assortment of Sigma lenses for you to use and experiment with for the day. We will be heading up for sunrise and staying until mid afternoon but will have lots of time to teach and review throughout the session. From creating silky looking water to capturing any wildlife we see along the way, there will be so much information covered that you will gain confidence and skill in your photography and how you know how to use your equipment. This is the 9th time we have done this session and you will be amazed at how much you enjoy it! By popular demand, we were able to convince macro photography wizard, Don Komarechka to hold one more session with us in 2015. If you have a fascination for the beauty all around you and find yourself inspired by the tiniest little details than macro photography is for you. Don Komarechka sees the world in a different way and likes to play by his own rules and this certainly helps when it comes to the world of macro photography. If you see Don's photography you can stare at it for hours and when you look away, then look back, that raw amazement kicks right back in. His attention to detail and striking colour choices make his images linger in your mind long after you walk away from his print. His talent is undeniable. But here's the really cool part... Not only is he an amazing photographer, he is a phenomenal educator and welcomes you into his world and offers you extreme detail and understanding on how to achieve these images for yourself! What is even better is that Bryan Weiss from Daytripper Photo is also there making the personal support you may need that much more available. Another exclusive offer is that each person that registers for this joint session will receive a copy of Don's book Sky Crystals. The definitive book on snowflake and macro photography. Please join Daytripper Photo and Don Komarechka at Don's home in Barrie Ontario on September 1st as we marvel you with the details of the world around you. 3rd annual DTP Summer BBQ! This time, with FIREWORKS! This June 30th, Daytripper Photo will be holding our 3rd annual Summer BBQ and this year it will have a real BANG!! For the past 2 years, our BBQ took place at Joker Hill and was always an amazing time. This year, we are moving it out of the protected scientific reserve and into the open fields of Holland Landing! We will start off the night with a delicious BBQ and all the fixins. Each class participant pays the 200.00 and it's 50.00 for each extra guest that isnt bringing a camera. After we get all set up and have our full photography essentials class, we will begin the real class and the fireworks will begin! This is going to be a full out fireworks display and its for the sole purpose of learning how to make the best fireworks photos possible! They will be chosen for height, spread, colour, and patterns and be launched only when you are ready to shoot them! With the Daytripper instructors by your side every step of the way, you will get the guidance and support you need to fully understand how to make spectacular fireworks photos! The session will run from 7pm - 11:30pm and will culminate with a classic Canada Day Fireworks GRAND FINALE! This session is only $200.00 for a full evening of custom fireworks and BBQ food and fun! On this session we will be heading up to visit 4 of the Muskoka area's best waterfalls. With hands on support and lenses and filters for you to use for the day, you will learn the skills needed to make amazing waterfall photos. Learn with our Daytripper Photo instructors by your side the whole time, guiding you to a higher understanding of photography and helping you gain control of your camera and your creativity! We will be taking the Mobile Classroom up for this trip so no need to drive PLUS you get a full photography class on the drive there! The full day of shooting waterfalls with instructors by your side every step of the way, Sigma lenses to use for the day (Courtesy of Gentec intl. and Sigma), photo review and option for a follow up How 2 Hangout after the session is only $350.00! The optional H2H is an online photo review and edit session that you can participate in from home on your own computer! This is only an extra $40.00! Get hands on experience with using lighting while getting advice from our skilled instructors. There will be four zones for you to shoot at and have hands on help with lighting, posing, and editing! Bring on the night - Fire on ice. The 2nd annual spin off competition! This session has been postponed until March 1st 2015 due to extremely cold weather. This will be a continuation of the first BOTN Fire on Ice session. We will cover the fundamentals of capturing these spectacular images. The big difference is that we will be turning this into an actual steel wool spinning competition! The 2nd annual BOTN Steel wool challenge! Spinners from all over will be on hand to show you their custom steel wool spinning contraptions and we can all sit back and capture these spectacular sprays of sparks on every photo! Our fire on ice session is back! We will be out on a frozen lake making amazing images using everything from a spinning light globe to burning steel wool! This session will teach you how to achieve focus, use manual camera settings, and many other techniques for making compelling artistic photos in no light! Hands on instruction on how to control light and paint fantastic images in pitch black. Learn how to achieve focus and bring out your creativity with this fun and challenging art form. In a studio environment we will be showing you exactly how to make images that will amaze and the leave you with the know how to take it to anywhere you can imagine.